The week kicks off with several April 15 activities highlighted by the 7th Annual Jim Maloof’s Legacy of Love for the Arts in Central Illinois event at 6:30 pm in the Performing Arts Center. The family-friendly event showcases performing arts talent from the Central Illinois area, while honoring the legacy of former Peoria Mayor Maloof. 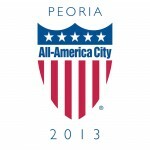 The event will be followed by a cookie and lemonade reception sponsored by Chick-fil-A of Peoria. Tickets to the event cost $8, with all proceeds benefiting Maloof’s signature accomplishment, St. Jude Children’s Research Hospital. Tickets can be purchased at ArtsAtICC.com or through the Performing Arts Center Box Office at (309) 694-5136.